Are professional expert witnesses a ‘good thing’? If you are a hired gun, is it not tempting to say whatever helps your client? In fact, there’s good evidence that the opposite occurs. Those who testify become more scrupulous in their views. A leading arbitrator, Doug Jones AO, put it this way, a few years ago, speaking at at GAR Live Dubai: “Repeat experts [...] are a good thing,” he said, explaining that his experience of experts who do it repeatedly is that they get to realise that their own personal reputations depend on avoiding extreme positions which are unsustainable. Further, “they get to understand that they will be far more effective if they put forward fair propositions that they can themselves inte­llectually justify,” Jones explained. Of course, there are exceptions – from time to time, stories circulate of an expert who appeared to give diametrically opposite evidence on the same point in different cases (and discussions about the attendant problem of “how to police” such behaviour also take place). But for the most part, giving evidence repeatedly appears to forge a more principled expert. So, if “repeat” experts are better for the process, how does one find such people? The report you are reading – the expert witnesses section of the GAR 100 and the tables in it – should help. We apply the same method to expert witness firms that we use in the GAR 30. We use “the hearing” as a lens through which to see how active different organisations are (as with this publication’s survey of law firms, we used a research period of 1 August 2015 to 1 August 2017). We collected information on these hearings from both law firms and expert witness firms and determined a total for hearings per expert firm over our two-year research period. We also determined the average and median value of claims for each arbitration. From the data submitted by expert witness firms separated out different types of arbitration: commercial, investor-state and industry-specific. This year, we include 28 firms, up from 18 last year. The results are presented in several tables. 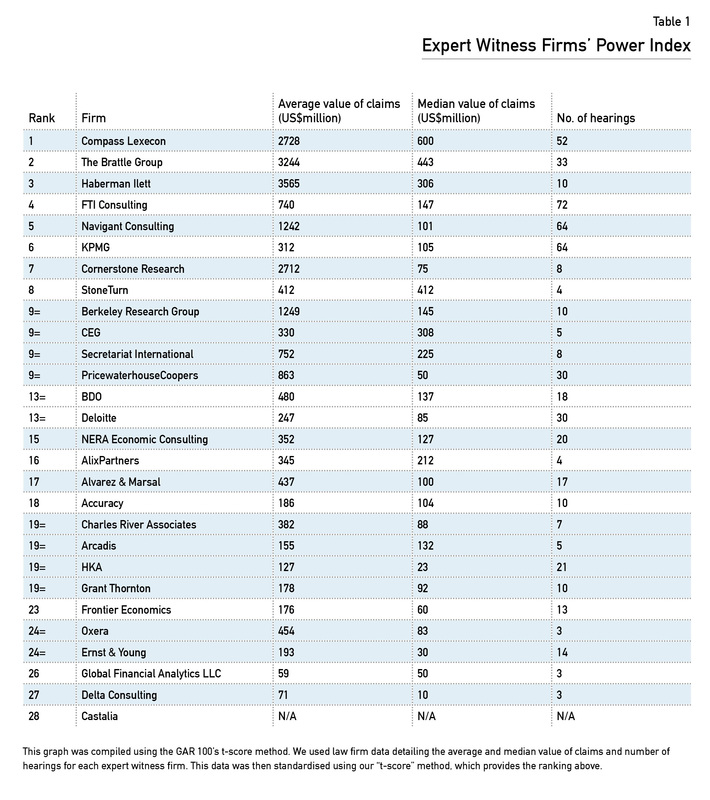 Table 1 is the GAR 100 Expert Witness Firms’ Power Index. This is a new table. It’s a smaller version of the GAR 30 – about experts. Table 2 shows the total number of hearings accumulated by members of a firm in those two years. Table 3 shows the (mean) average and the median value of claim sought in arbitration. 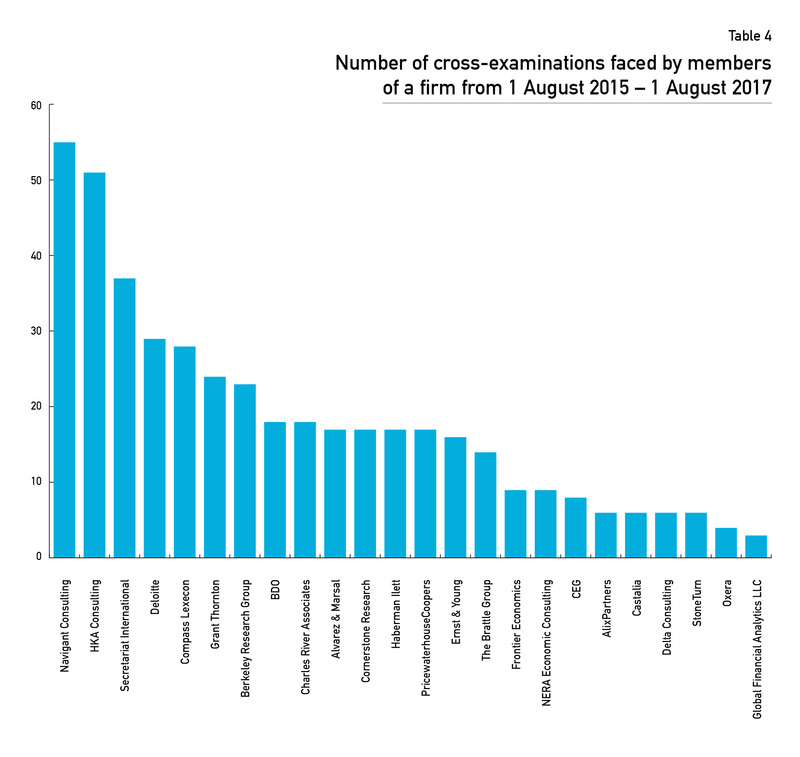 Table 4 shows the number of cross-examinations members faced by members of a firm in the same time frame. 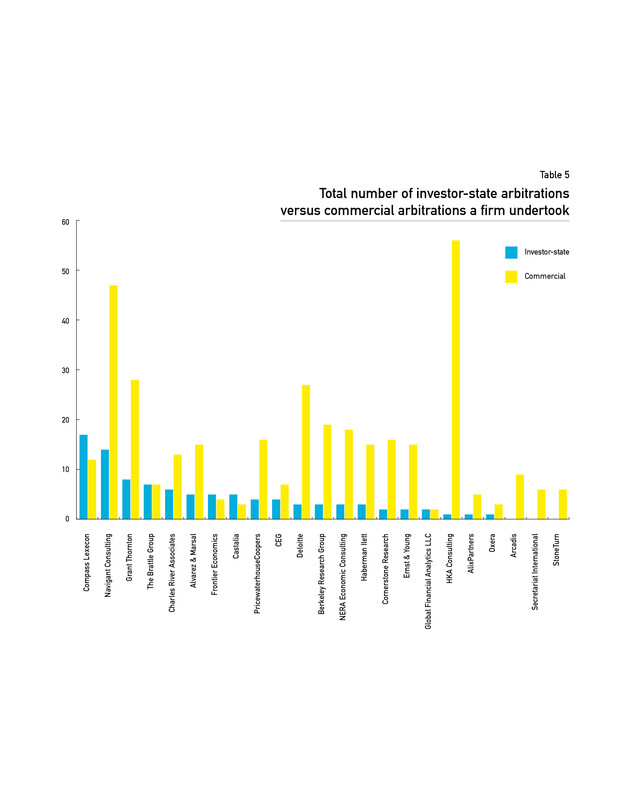 Table 5 shows the total number of investor-state arbitrations versus commercial arbitrations a firm undertook. 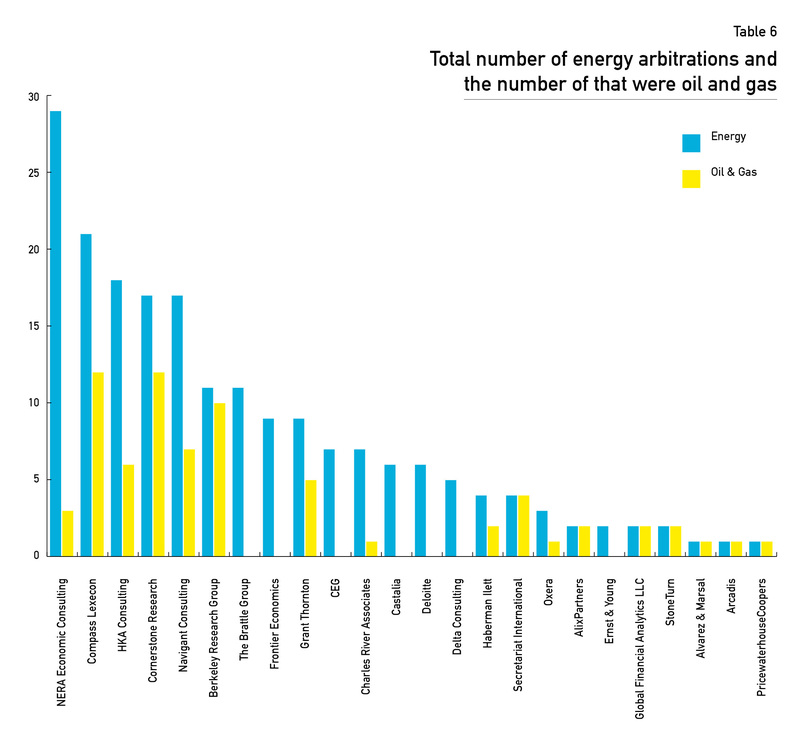 Table 6 shows the total number of energy arbitrations and the number of that were oil and gas. 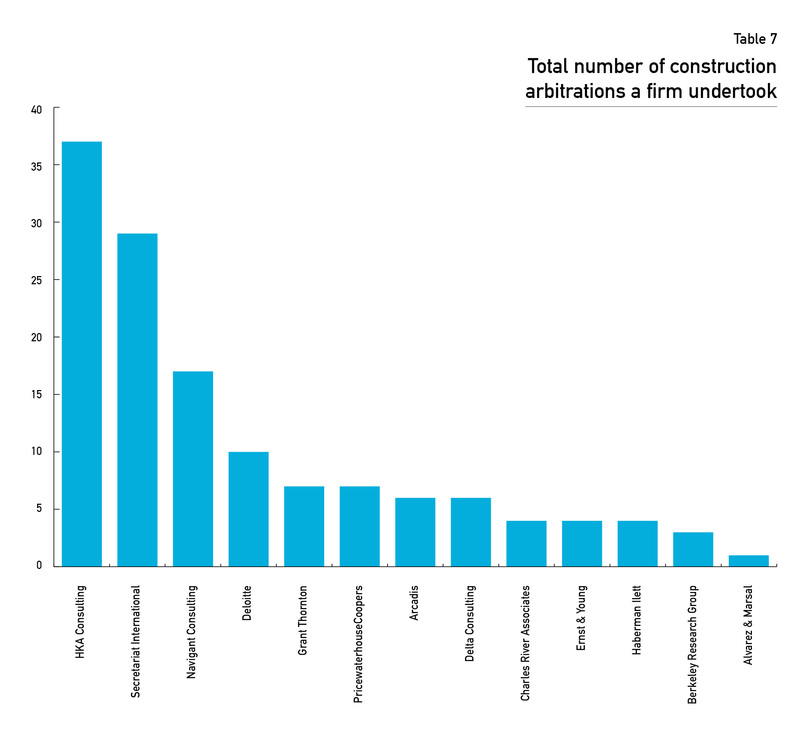 Table 7 shows the total number of construction arbitrations a firm undertook. Some other tables – chiefly table 4 – is generated using data supplied by the expert witness firms themselves. In table 2, we use our sister publication, Who’s Who Legal: Arbitration 2018 as a proxy for market recognition enjoyed by a team. 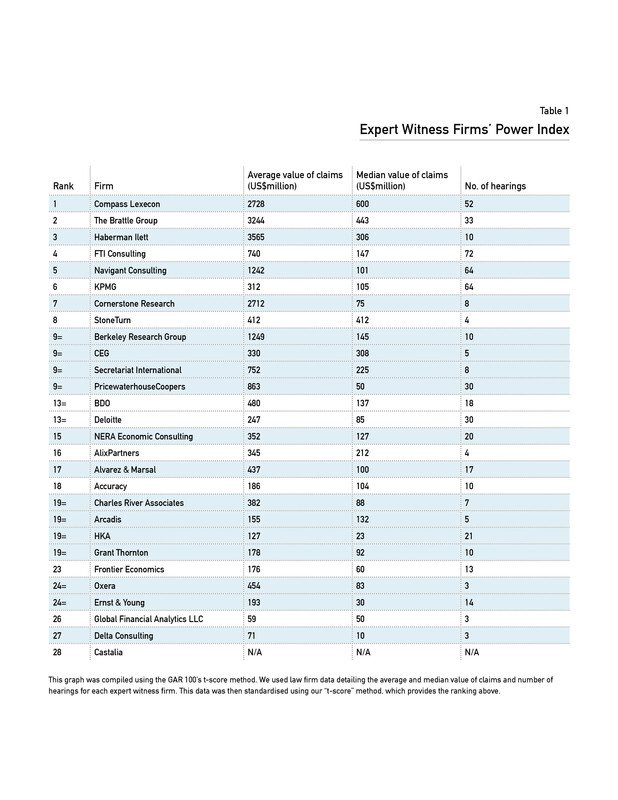 For the first time, we’ve combined some of this data to create an overall GAR Expert Witness Firms’ Power Index. The Power Index uses quantitative data from law firms from the first two tables (ie, the number of hearings (table 2) and the average and median value of claims (table 3)). This generates a score and ranking that blends volume and value. This is the third year we’ve surveyed the expert witness firms. It’s important to recognise the project’s limitations. Most notably, if the largest case an expert firm has worked on was handled by a firm other than a GAR 100 firm or GAR 100 candidate firm, then it won’t have appeared on our radar, so it hasn’t been included. These figures we present are not everything an expert firm has worked on; it is everything the firm has worked on that we could identify. There is a difference. Nevertheless, the tables offer an insight into who is doing what in the marketplace. 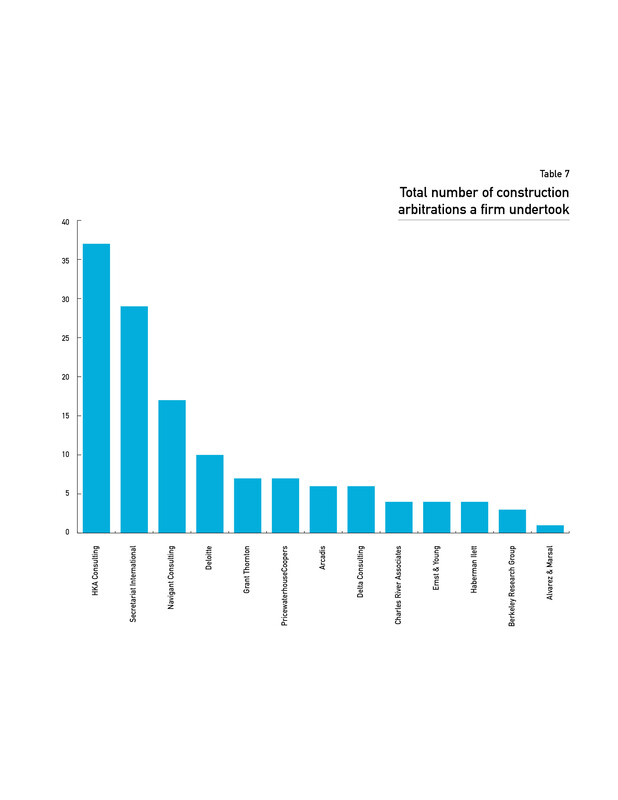 Want to know which expert witness firm is most active in construction arbitrations? Go to table 7. 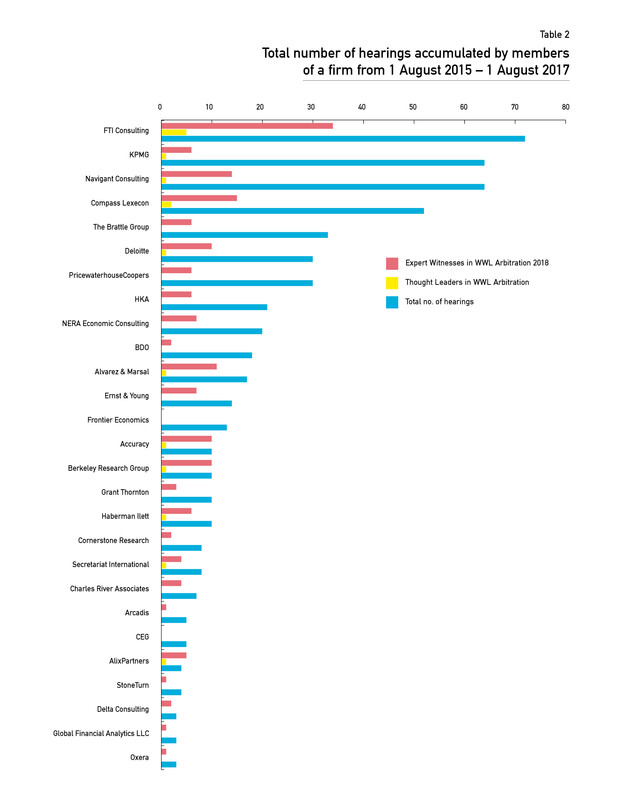 Want to see which firms are weighted towards investor-state arbitrations? Go to table 5. Want to see if there is a correlation between number of recognised individuals and activity? Go to table 2. Here, we use our sister publication Who’s Who Legal: Arbitration 2018 to illustrate market recognition. We then twin it with the number of hearings for each firm, allowing us to determine the amount of activity by each team. You can find the Power Index on page 225. As with the GAR 30 for law firms, the index sorts firms into an order according to a score. Because it is a series, small differences in performance can be magnified by the act of giving them a finishing position: there may in fact be almost no difference between, say, position 11 and 20 in ranking, yet it sounds as if there is. Such is the nature of these projects. As with the 30, the Power Index is generated using T-scores, a statistical technique that allows different distributions of data to be compared and combined in a meaningful way. It’s all about performance relative to the average performance: are you above or below the average performance – and by how much? For the Power Index, we compared performances in average size of hearing; median size of hearing; and total number of hearings. It thus blends proxies for the quality (value) of a firm’s work with quantity (volume). As mentioned above, we construct this index from the data we have (information collected from the GAR 100 law firms and candidate firms). Top slot this year goes to Compass Lexecon. It achieves that by scoring well on both sides of the equation – volume and value. Its average value of claim (just north of US$2.7 billion) is particularly impressive when compared to some of the other high-volume practices. And on the volume side, while not the busiest practice in the hearings column (FTI Consulting has 20 more hearings), it performs creditably. (It is worth noting at this point that FTI Consulting owns Compass Lexecon, but operates it as a separate brand.) One of the reasons for Compass Lexecon’s high average value of claims (over US$2.7 billion) could be its weighting to investor-state arbitration, which is prone to high-value claims – it acted in 17, as opposed to 12 commercial arbitrations over the course of our research (table 5). One of those was a dispute arising out of Venezuela’s decision to nationalise three oil projects owned and managed by Dutch firm ConocoPhillips. Compass Lexecon acted for the oil major, which eventually won at ICSID. The Brattle Group takes second thanks to a strong performance on number of hearings (it saw 33 over our two-year research period) and an exceptional performance when it comes to value of claims (its average was over US$3.2 billion, its median over US$400 million). This makes its average value the second-highest in the survey. The practice has been working on some of the largest investor-state arbitrations under way in oil and gas, renewable energy and mining, which helps to explain this out-performance when it comes to case size. One of its economic experts was appointed on the long-running dispute between Perenco Ecuador Limited and the Ecuadorean state. Haberman Ilett’s third place is particularly striking, as it is a newer name than both Compass Lexecon and The Brattle Group – it was founded in 2013, as opposed to 1977 and 1990 for Compass and The Battle Group respectively. It was formed by Philip Haberman and Frank Ilett – both former employees of the “Big Four” accounting firms – and, as our research shows, is already among the group of firms trusted to manage the larger cases. Indeed, the firm’s strong performance here is in large part because of its familiarity with oil and gas arbitration. It has worked recently on one gas supply contract dispute where the value of claims sought was over US$10 billion. FTI Consulting, fourth, had more than twice the number of hearings as The Brattle Group, and the highest in the survey. Its average value of claim, however, was lower. That is not to say it doesn’t handle the biggest work. It acted for a major international retailer on an arbitration of US$1.2 billion and an investor-state arbitration between Marfin Investment Group Holdings and the Republic of Cyprus for over US$1 billion. But the lower figures in the average and median columns stopped it from being higher in the table, while still impressive for such a busy practice. 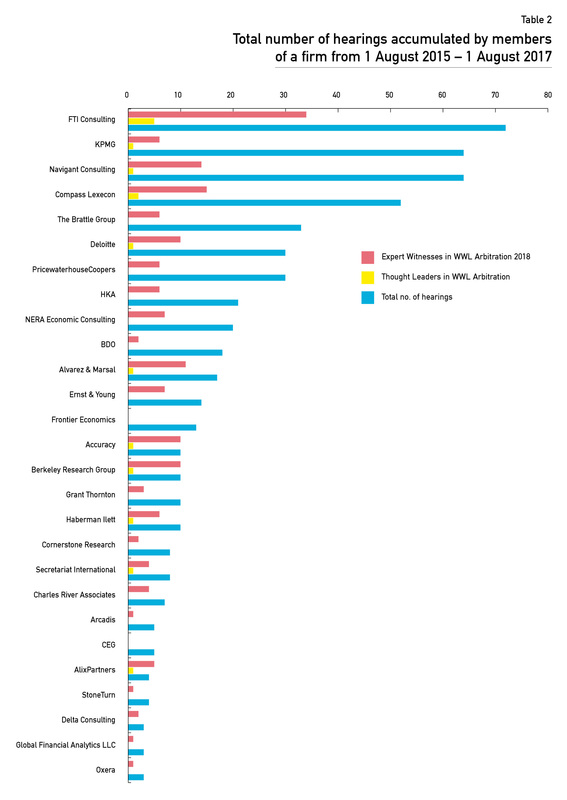 Navigant and KPMG in fifth and sixth respectively were level on the number of hearings, and close on median value. Navigant’s average value, however, was far higher, thanks to the firm’s involvement in several multibillion-dollar cases, two of which were investor-state cases and another which was between two high-net worth individuals. The largest was an investor-state arbitration about interrupted gas supplies. Cornerstone Research, in seventh, is another firm boosted more by the quality of its cases than their volume. 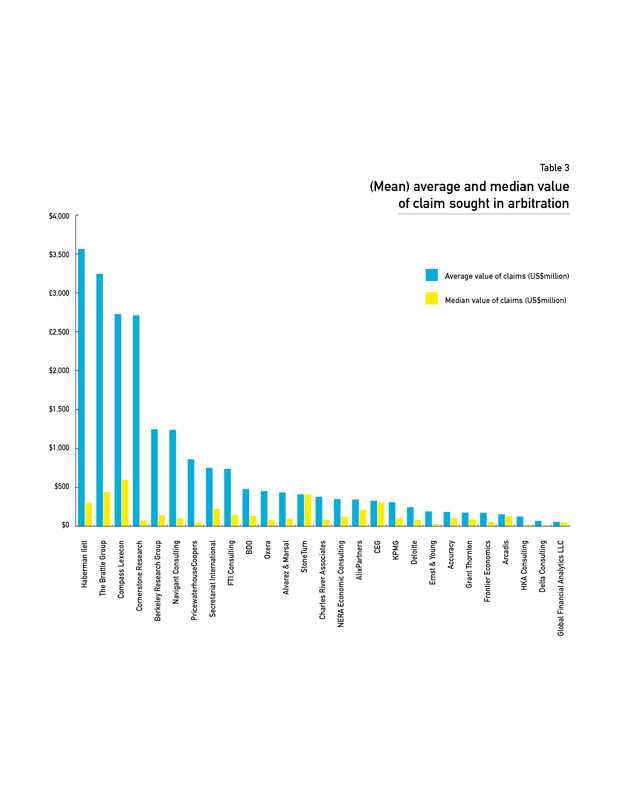 Its high-value work includes one oil and one electricity arbitration with claims of more than US$2 billion and US$1 billion respectively, meaning that the average value of its claims (over US$2.7 billion) was the fourth highest surveyed. Cornerstone was founded in 1989 and has since expanded across the US, with an additional office in London. The low score, relatively speaking, for median value (US$75 million) shows the work is a mixed bag in terms of size. It is also less active in international arbitration than many of the organisations either side of it in the table – at present. StoneTurn, in eighth, provides an interesting result. It could be thought of as newer name in international arbitration, as reflected by its lower figure for overall hearings (table 1). But it achieves its eighth position on the back of four hearings that were all around the half a billion mark. Indeed the firm’s performance in the research was notable for its consistency. StoneTurn was the only firm to have the same figure for median and average hearing size. Based in Boston, Massachusetts, StoneTurn was founded in 2004 and has since built up a team with particular experience in quantification of damages. Its five senior-most experts have together given expert testimony over 50 times in their careers. Berkeley Research Group, which comes ninth equal with three other firms, owes its position to the high average claim value. It saw several multibillion-dollar arbitrations, including two investor-state cases – the largest of which was the gas supply dispute between Unión Fenosa Gas and the Arab Republic of Egypt – with claims above US$2 billion. The firm was founded in 2010 and since then has expanded its international arbitration group to over 50 professionals. It is head­quartered in Emeryville, California. CEG, Secretariat International and PWC are the other joint ninth place finishers. CEG’s average and median value of claims are close at US$330 million and US$308 million respectively. Several of these were significant claims in the energy sector. CEG was founded in 2007 and has developed a reputation one of the leading competition damages teams in the market. Secretariat International has a higher number of hearings and average value of claims than CEG, but falls down on its median value of claims (US$225 million). However it performs very well in our construction ranking (table 7), of which more later. PWC is the second-highest-scoring member of the “Big Four”. Its average value of claims may account for this (US$863 million) – it acted on LSF-KEB Holdings SCA and others v Republic of Korea, an investor-state construction arbitration with a claim of over US$4 billion, and a foreign investment arbitration with a claim of over US$1 billion. Finally, Alvarez & Marsal only just missed out on the top 10. It’s strongest suit – the number of recognised individuals – is discussed in more detail below. And that’s the top 10 of this year’s Power Index. FTI has the highest number of expert witnesses and Thought Leaders in Who’s Who Legal at 33 and five respectively. And FTI is also top for the number of hearings – which is as it was last year. FTI’s hearings total has risen from 68 last year to 72 this year. Navigant and Compass Lexecon, in third and fourth position respectively, also do well in both columns, creating a trio of firms where high number of recognised individuals appears to translate to number of hearings. That pattern, however, breaks as soon as one examines KPMG, in second slot. Fewer KPMG practitioners make the threshold required for Who’s Who Legal, but the practice still racks up 64 hearings. It may be that a firm such as KPMG is confident that institutional relationships with companies will always bring appointments and is therefore less reliant on maintaining high market recognition to attract work. Or it may simply be under-recognised. The Brattle Group, in fifth, has six experts recognised. Its strong score on both volume and value in other tables begins to look all the more impressive: it is both close to, say, a Haberman Ilett on value of claims, and also right up there on the volume side too. Indeed, it is those 33 hearings that in large part help it to second place in the Power Index. Deloitte, in sixth, has three hearings for every one of its 10 recognised names in Who’s Who Legal: Arbitration 2018. It remained the largest accounting firm in the world in 2017, which demonstrates that, while it is at the top of market overall, it is not yet at the same level when it comes to international arbitration. It is taking steps to strengthen its position, however – specifically with the return of Anthony Charlton at the end of 2015 as head of the international arbitration team in France, and Andrew Flower, who moved from France to the UK where he heads the firm’s global dispute consulting service. PricewaterhouseCoopers, by comparison, has the same number of hearings – 30 – but only six experts listed in Who’s Who Legal, either suggesting that its experts have seen more hearings each or that several of its practitioners are busy but did not achieve highly enough to get into Who’s Who Legal this year. Alvarez & Marsal, in eleventh place, is an interesting element in this table. It has many more recognised names in it than some firms that finish higher in the overall ranking – 11 experts are listed in Who’s Who Legal: Arbitration 2018. Indeed, were the table measuring simply recognised individuals in Who’s Who Legal, Alvarez & Marsal would be fourth. A strong finish. It will be interesting to see whether its ability to attract (or create) people with such a strong market profile translates into more completed hearings in future editions. It is already working with some well-known law firms such as White & Case, K&L Gates, and Noerr. Table 3 compares the (mean) average and median value of claim sought in arbitration. This is so that the average size of claim for each firm can be shown alongside a figure that tells you something about the spread of values. Sometimes median gives you a better idea of the “central tendency” in a data set. So here we present both (but we use the average in this table to rank the table). On average value of claims, Haberman Ilett takes the top spot from last year’s number one Berkeley Research Group (which falls to fifth this year). As mentioned, Haberman Ilett was formed by Philip Haberman and Frank Ilett – both former employees of the “Big Four” accounting firms – and has carved out a name in the market off the back of some significant cases both in terms of value and what’s at stake, strategically. Second and third are The Brattle Group and Compass Lexecon (also already discussed). The Brattle Group acted on a number of oil and gas arbitrations with claims greater than US$1 billion – one of which was an oil-related dispute in which the firm’s experts acted for the claimant on quantum matters and another of which was the LSF-KEB Holdings SCA and others v Republic of Korea dispute. 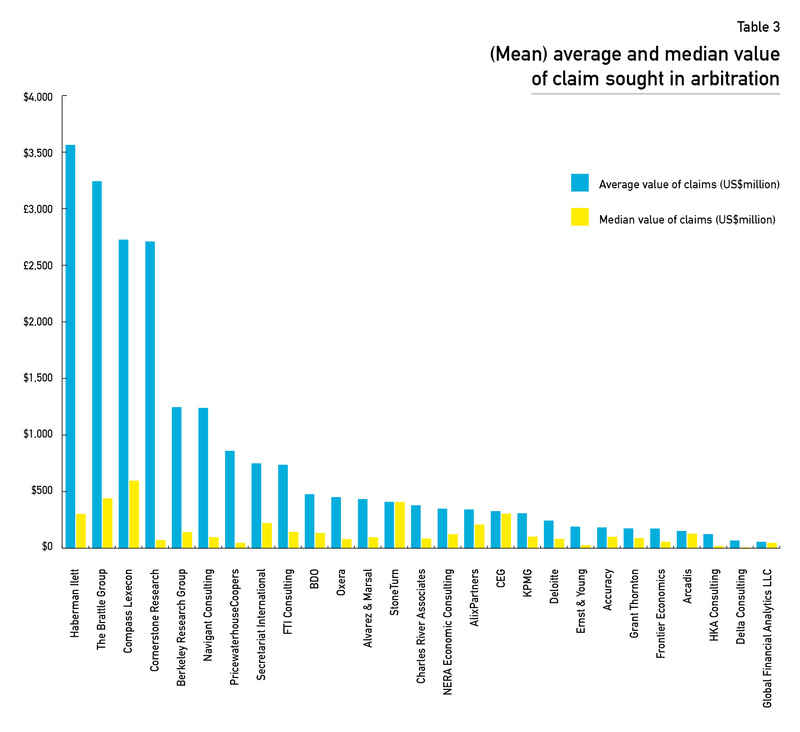 Compass Lexecon had the highest median value of claim. From our review of law firm hearings, it appears that 18 of the arbitrations on which it was appointed had claims of over US$1 billion, and three of those were over US$10 billion. All of these were large oil and gas arbitrations, two of which were investor-state matters – which perhaps accounts for Compass Lexecon’s performance as investor-state matters trend towards the higher claim. They were followed by Cornerstone Research (already discussed), Berkeley Research Group and Navigant. Berkeley Research Group, for its part, was mentioned 14 times in our law firm data; three of those claims were for more than US$1 billion. One was a major oil and gas arbitration, two were investor-state cases – one relating to a transport dispute in the Federal Republic of Germany and the other a gas supply dispute involving a private company and the Arab Republic of Egypt. Meanwhile, Navigant’s average and median scores appear all the more impressive when one considers the scale of its practice. It achieved those levels across 64 hearings (compared with, say, Berkeley Research Group’s 10). Navigant was founded in 1999 and has doubled its arbitration team since the turn of the decade, with experts such as Brent Kaczmarek becoming the arbitral equivalent of a household name, particularly after acting as expert for the claimants on the Yukos arbitration, which went on to yield the largest award in arbitration history. He has also testified on behalf of Gold Reserves, a Canadian mining firm, that won $740 million from Venezuela, as well as in a number of other Venezuela-related cases. It makes sense, if placing an emphasis on hearings, to look also at cross-examinations. From hereon, we were reliant on data submitted by the expert witness firms, rather than from independent sources. The upside, however, is that tables 4-7 may give a more accurate picture of the real size of a firm’s activity than the column in the Power Index on hearings. With that in mind, it is notable that Navigant Consulting (one of the busiest firms in the Power Index) reported the highest number of cross-examinations (on 55 cross examinations). In second, third and fourth, we have HKA, Secretariat International and Deloitte. HKA – the result of a management buyout of Hill International’s Construction Claims & Consulting Group – specialises in construction claims, working with, among others, Allen & Overy, Baker McKenzie and White & Case. The majority of these construction claims are commercial, our information shows. Construction disputes are often long and complicated, which may explain why firms such as HKA seem to have racked up more cross examinations than some. 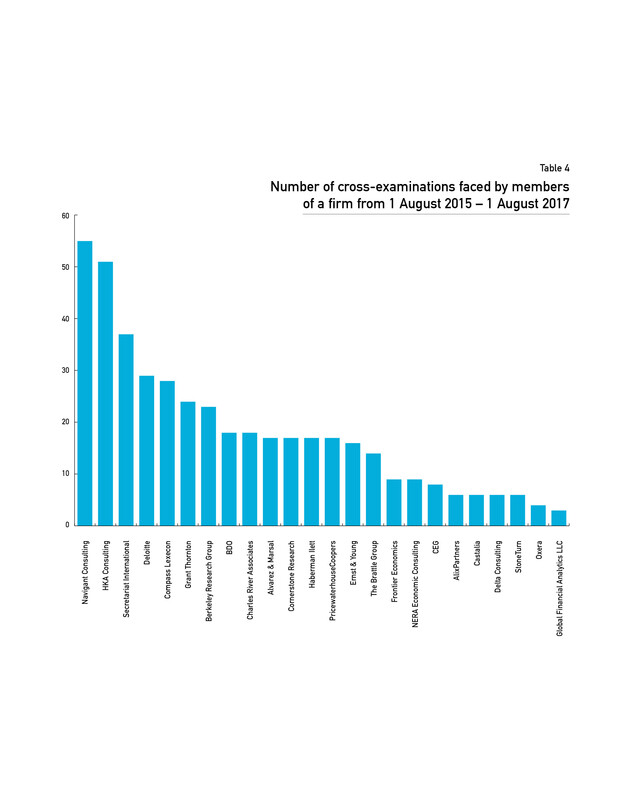 Secretariat International has 37 cross-examinations. As a firm, it also has a strong weighting towards construction work, both delay analysis and quantum and damages issues. The firm was founded in 2008 by Don Harvey, a well-known name in US construction and engineering circles, and has since expanded across the world with offices in locations including the US, UK, Singapore and Mexico. Deloitte’s strong showing – 29 cross-examinations – is mainly in damages relating to commercial construction and energy cases – Andrew Flower, Jacqui Record and Anthony Charlton appear multiple times. 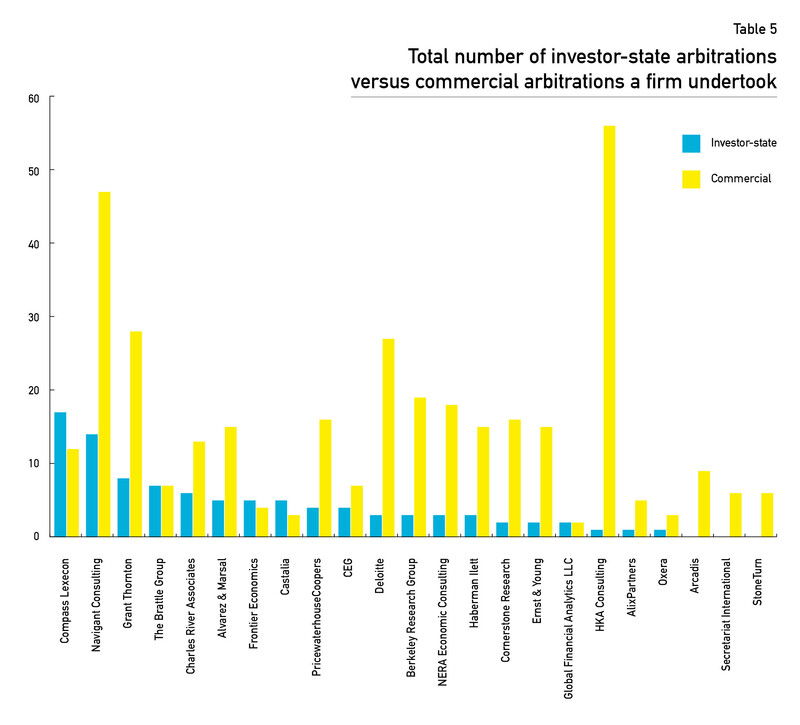 Table 5 shows how much investor-state arbitration a firm undertakes within its overall work. Second is Navigant, which again won’t be a huge surprise to the market. From the data they provided, they were appointed on 14 investor-state cases over our research period (see table 5). Several of the cases they provided were confidential so this number could in fact be even higher. Some of the most significant investor-state matters the firm has been in over the years are Glamis Gold Ltd v The United States of America, a mining dispute; Cargill v Mexico, a case about high-fructose corn syrup that led to an award just shy of US$80 million; and Chevron v The Republic of Ecuador, over changes the Ecuadorian government introduced that affected seven oil exploration contracts. Third, however, is Grant Thornton, which in other tables has been something of a dark horse. Its investor-state work is focussed on partners such as Vidya Rajarao and Hisham Farouk and includes cases for quantum, valuation and fraud matters in construction – Kontinental Conseil Ingénierie v Gabonese Republic – oil and gas – Caratube International Oil Company LLP v The Republic of Kazakhstan – healthcare and private client work. Grant Thornton, in contrast to Compass Lexecon, also has a decent-sized commercial arbitration practice. Indeed, looking at Grant Thornton in all the tables it becomes clear it is one of the more well-balanced practices. It is competitive in the industry-specific tables (it comes fifth for construction cases, table 7), the investor-state table, as well as on number of cross-examinations (table 4). Table 6 extracts the firm’s energy industry work (and within that oil and gas matters). Table 7, its work in construction.Last, we come to the breakdown of work by industry. These show that NERA Economic Consulting is overwhelmingly at present the most active firm on energy cases, while HKA and Secretariat International lead the field for construction arbitration. NERA’s performance in the energy table is no real surprise (it comes top for sheer volume) since the firm first grew from work for utilities and other regulated industries (including power companies). Sure enough, nine of its active experts specialise in energy matters; one, Dr Fabrizio Hernández, is the former Spanish secretary of state for energy. NERA is one of the most long-standing consulting firms; it was established in 1961 and has since developed an arbitration team of over 40 experts. What’s notable in NERA’s work is how few of the energy matters are traditional oil and gas cases. The bulk are about electric power and renewables instead. For oil and gas matters, the busiest firms appear to be Compass Lexecon, Cornerstone and Berkeley Research Group. Similarly, as mentioned, both HKA and Secretariat International have roots in construction industry consulting – and both are to be found near the top of table 7, with 37 cases to 29, respectively. HKA is now the world’s largest construction consulting group. David Carrick and Wendy MacLoughlin were often called upon during our research period to act on big construction cases. While Secretariat had fewer cases overall, it had a more concentrated pool of experts that were called on – Amit Garg, Don Harvey and Ted Scott were all used on multiple occasions. 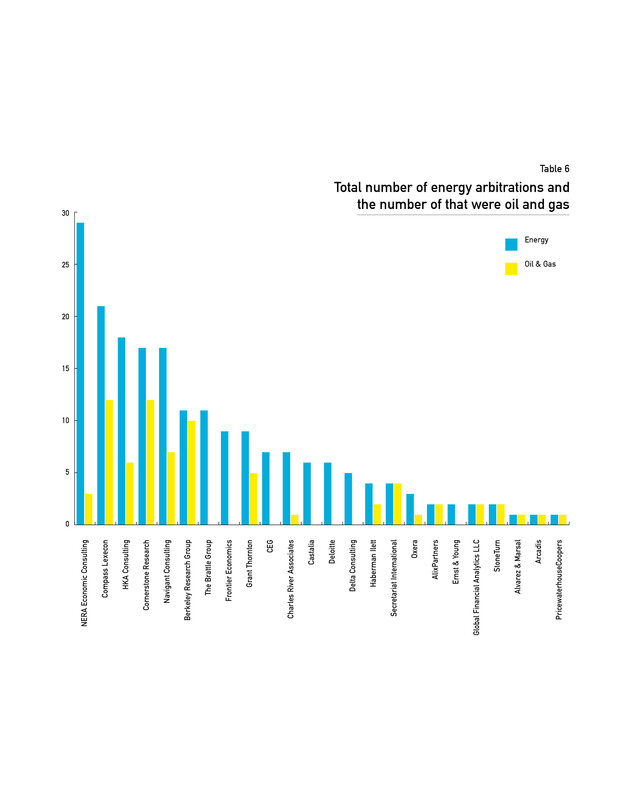 In terms of activity versus size, Delta Consulting comes out as an impressive contender in our table of energy (table 6) and construction (table 7) arbitrations. What is particularly interesting is how the two overlap; most of the claims on which it was appointed qualified as both construction and energy-related matters (hence the number of appointments on both tables are pretty much equal at five and six, respectively). The firm’s current incarnation was founded in 2000 and its arbitration team is currently 10 strong. The firm specialises in consulting on large scale engineering projects (many of which these days are energy related). Co-founder Jeffrey Fuchs was appointed four times over the past two years on large-scale arbitrations, including to provide an expert opinion on damages claims regarding the dispute between the GUPC consortium and the Panama Canal Authority. In terms of individuals, certain “famous names” cropped up time and time again as we reviewed our tables of law firm work. Brent Kaczmarek is mentioned 17 times by law firms who appointed Navigant, Pablo Spiller comes up 17 times for cases on which Compass Lexecon was instructed and Carlos Lapuerta is noted 15 times for cases on which The Brattle Group was instructed. A common statement from experts is that it is often difficult for new names to break through, because their clients desire trusted names who are experienced testifying experts. Our research would suggest that the tension between putting on a well-known name and giving the next generation a chance to get flying hours hasn’t gone away. 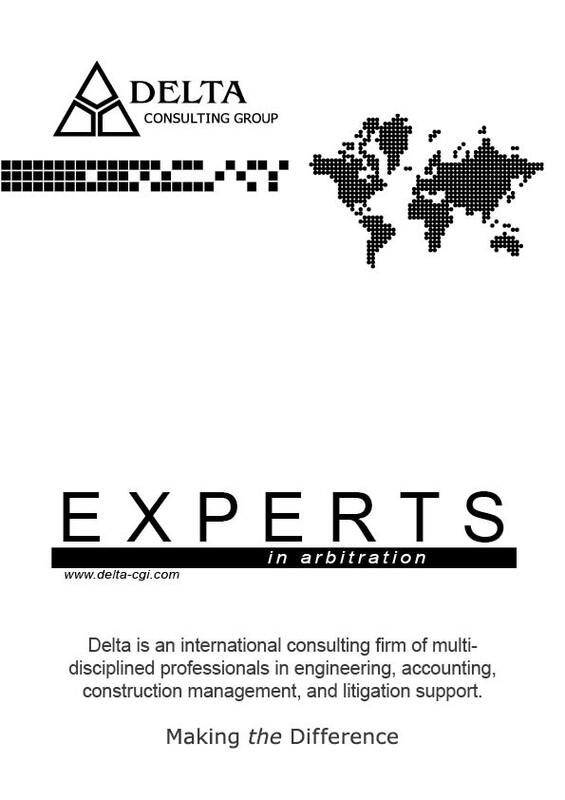 Delta Consulting Group is an international consulting firm of multi-disciplined professionals in engineering, accounting, construction, project management, and litigation support. Services include: delay analysis, quantification of damages, loss of productivity, project controls, construction audits, scheduling, budget analysis, and expert witness services, among others, on multifaceted litigation and arbitration cases around the world. Delta assists clients from the beginning of a project or we step in when a project is failing and help our clients find a successful resolution. Drawing upon years of industry knowledge and experience our experts have a thorough understanding of the complex challenges facing our clients and their legal counsel. Regardless if the matter involves a damage and delay claim, loss of productivity analysis, schedule oversight, or financial analysis, we are able help our clients minimize their risks and find solutions quickly and efficiently. Our professionals provide expert reports and testimony before various US federal and state courts, US Bankruptcy courts, JAMS, at ICC Arbitration proceedings, at UNCITRAL, and at the ICDR in New York. The Delta team is “making the difference” for our clients.